1. Hoan Kiehm Lake – a beautiful lake in the middle of Hanoi. Exercise central. 3. Aggressive sellers of everything on the street. Fruit. Shoes. Shoe polishers. 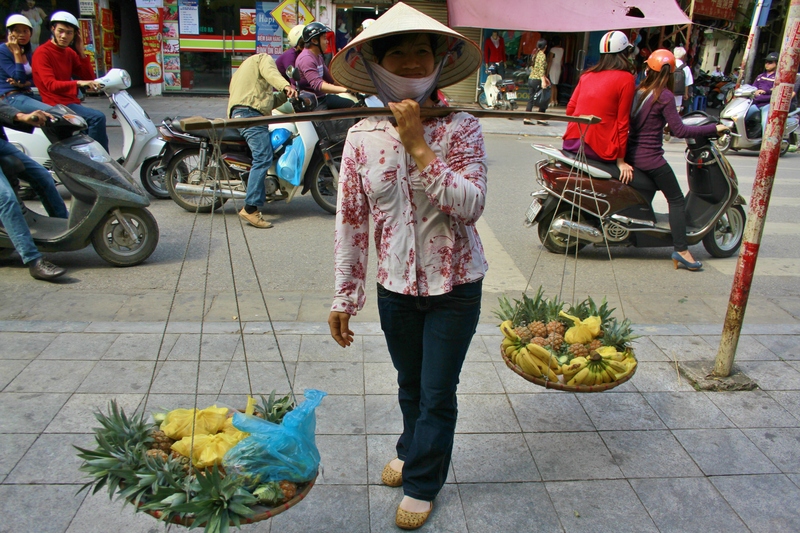 Knick-knacks (I actually bought a handmade citrus zester for 1USD – 20000 Vietnamese Dong – on the street). 4. Cyclos. These rickshaws-with-wheels may not look like much, but riding in one is akin to taking one’s life in one’s own hands. Exciting! Do it! 6. Beer – so very good! Rivals Ireland and Germany. Belgian is better, though. 8. Little tiny stools for, well, not Americans! 9. Silk. Lacquer. Bamboo. Easy gifts to transport home. 10. Pollution. Rivals LA. Maybe – no, probably – worse. 13. Lots and lots of pre-wedding bride-and-groom photo sessions on the streets. The brides wore all their regalia and were so beautiful. The grooms looked like they considered themselves the luckiest guys in the world (except for one who looked extremely bored – I’m not very hopeful for that marriage)! 14. Crowds but no malice or evil intent. One should watch his or her belongings but doesn’t have to be super-paranoid about it. Women are safe walking alone in the city. 16. Women riding side-saddle. How the heck do they stay on those scooters??? 17. Texting and talking on cell phones while operating a motorbike. 19. Levels upon levels of apartments with laundry hanging on balconies and plants in pots. 21. Traffic (I know. I’ve mentioned it in every post.) The thing about it, though, is that nobody’s mean or angry. In the US, if cars and motorbikes were this thick, the honking would be rife with fury; there would be cursing and gnashing of teeth. 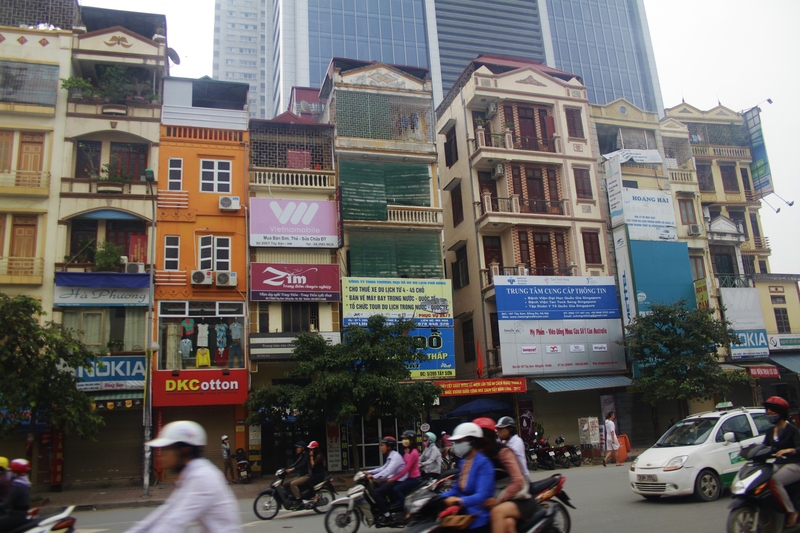 In Hanoi, faces remain placid as motorbikes zoom around just an inch or two (literally) from your toes. People are friendly and seem quite patient amidst the chaos. Wow. This entry was posted in Vietnam 2011 and tagged bamboo, bride-and-groom, busses, conical hats, cyclo, cyclo drivers, cyclos, Dong, fruit, Hanoi, Hoan Kiehm Lake, lacquer, motorbikes, pedestrians, pollution, scooters, side-saddle, silk, street photography, street vendors, traffic, travel, travel photography, Vietnam, vietnamese dong, wedding photo session, wedding photo sessions. Bookmark the permalink. I loved this tour, especially the street food! 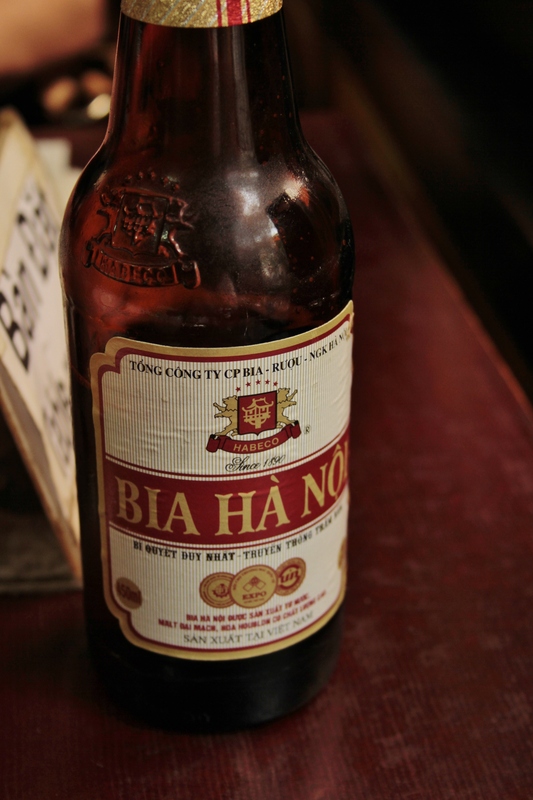 Hanoi is an interesting place that’s for sure. I love reading travel blogs so will keep an eye out for yours and btw, your observations are spot on. Me to. Its a pretty amazing place. Thank you so much. Your encouragement is so appreciated!